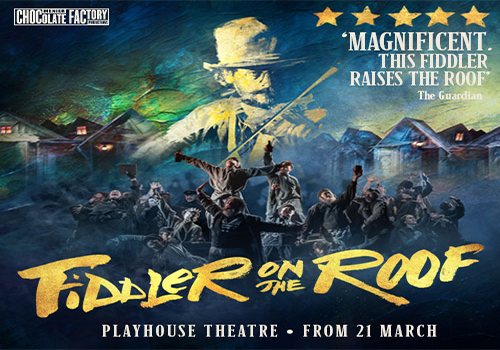 Transferring from a sold-out, five-star run at the Menier Chocolate Factory, Trevor Nunn’s revival of classic Broadway show Fiddler on the Roof dances into the Playhouse Theatre in London’s West End for a strictly limited run. The Playhouse Theatre box office is open Monday to Saturday from 10am to 8pm. Audience members collecting tickets for a show can do so within the hour before the performance is due to begin. collectors will need their booking reference number as well as the credit or debit card used to make the payment. Originally opening in 1882 as the Royal Avenue Theatre, the theatre was best-known for hosting comic operas, farce, music hall and burlesque, with the first ever production being Offenbach's Madame Favart. Playwright George Bernard Shaw made his debut at the theatre with Arms and the Man (1894), earning him enough acclaim to keep him in the public eye. In 1905, the theatre was rebuilt under new designs, but an accident from the nearby station caused the theatre to undergo repairs and reopen in 1907, with The Drums of Oudh and Toddles, as well as Shaw's The Interlude at the Playhouse. Early plays included Home and Beauty (1919), Mr. Abdulla (1926), The Letter (1927) and Dishonoured Lady (1930). Alec Guinness made his debut at the theatre in Libe! (1934). From 1951, The Playhouse became a recording studio for the BBC, with radio versions of The Goon Show and Steptoe and Son taking place at the venue. Concerts from bands such as Queen, Pink Floyd, The Beatles, Led Zeppelin, KISS, The Who and The Rolling Stones also were popular here. After the BBC departed in 1976, the theatre went dark. 1987 saw the theatre back in action, with productions such as musical Girlfriends (1987), The Rose Tattoo (1991), starring Julie Walters, Moliere's Tartuffe (1991), starring Felicity Kendal, It Runs in the Family (1992), Jane Eyre (1993), starring Tim Piggott-Smith, On Approval (1994) and Funny Money (1995). Throughout this time, the theatre changed management regularly, with further productions including dramas such as Ibsen's A Doll's House (1996). In 1996, English Heritage put the theatre under refurbishment, reopening in 1997 with Chekhov's The Wood Demon, before becoming a receiving house for the Almeida Theatre and Cheek by Jowl, including the premiere of David Hare's The Judas Kiss. In recent years, successes have included Chekhov's Three Sisters (2003), starring Kristin Scott Thomas, Vincent in Brixton (2003), Les Liaisons Dangereuses (2003-2004), Journey's End (2004), Romeo and Juliet (2004-2005), an RSC season (2005), The Postman Always Rings Twice (2005), As You Desire Me (2005-2006), starring Kristin Scott Thomas and Bob Hoskins, The Creeper (2006), My Name is Rachel Corrie (2006), by Alan Rickman, The Rocky Horror Show (2006), Dancing in the Streets (2006-2007), Footloose - the Musical (2007) and The Adventures of Tintin (2007-2008). Later notable musical successes have included La Cage aux Folles (2008-2010), starring Douglas Hodge and Graham Norton, Dreamboats and Petticoats (2010-2012), Simon Callow's The Mystery of Charles Dickens (2012), Monty Python's Spamalot (2012-2014), Lindsay Lohan in Speed-the-Plow (2014), a critically-acclaimed new production of 1984 (2014), Women on the Verge of a Nervous Breakdown (2015), starring Tamsin Greig and The Rocky Horror Show (2015), starring David Bedella and Ben Forster. Recent productions have featured Michael Flatley's last production, Lord of the Dance: Dangerous Games (2015-2016), Matthew Perry's The End of Longing (2016) and the return of 1984 (2016). J. B. Priestley's An Inspector Calls opened to acclaim in 2016, continuing for an extended period to 2017. Following the departure of An Inspector Calls, subsequent productions included a return of David Baddiel's comedy My Family: Not the Sitcom (2017), due to high demand. After a critically acclaimed season at Wyndham's Theatre, The Kite Runner (2017) soared into the Playhouse Theatre for limited performances, followed by Derren Brown: Underground. The year rounded off with an all-star cast in David Mamet's Glengarry Glen Ross, starring Christian Slater. 2018 saw Bill Kenwright's touring production of The Best Man play a limited season, starring Martin Shaw and Maureen Lipman. The Young Vic's The Jungle transferred to the Playhouse Theatre in June 2018, followed by the Chichester Festival Theatre's critically-acclaimed Caroline, or Change, which played from November - March. 2019 sees five-star Menier Chocolate Factory production Fiddler on the Roof transfer to the venue in March.